Boy Attacked by Wolf in Minnesota! MINNEAPOLIS — A canine believed to be a wolf chomped the head of a 16-year-old boy who was camping on Lake Winnibigoshish in north-central Minnesota, the Department of Natural Resources announced Monday. The teenager survived what the DNR called an "extremely rare" attack, but a wolf with a jaw deformity was trapped and killed in the area early Monday, said Tom Provost, regional manager for the DNR's enforcement division in Grand Rapids. Rabies test results on the animal are expected Tuesday or Wednesday, he told reporters. The DNR has no records of another serious injury or fatal wolf attack on a human in Minnesota before, he said. The only two recorded wolf attack fatalities in North America in the last decade were in northern Canada and Alaska. Assuming it's the same animal, Provost said, the wolf's jaw deformity is probably the reason it attacked the youth. While the male wolf was a normal 75 pounds, he said it would have had difficulty killing prey and likely was scavenging for food around the campground. Other campers told DNR officers an animal had bitten through their tents that night, puncturing an air mattress, and one camper said he saw a wolf near his campsite with similar colors and markings to the animal that attacked the teenager. "It was trapped in an area where it was likely habituated to humans and the ability to grab easy food," Provost said. "Not normal for wolf behavior." The boy was lying outside his tent near the shore at the West Winnie Campground around 4 a.m. Saturday and didn't hear or see the animal until it bit him on the back of the head, Provost said. He struggled to escape from its jaws and got up. The wolf didn't run off until he kicked it. Family and friends were nearby, performed first aid to stop the bleeding, and drove him to a Bemidji hospital, where he was treated and released for puncture wounds on the right and left sides of his face and a 4-inch laceration on his head. DNR officers were interviewing campers when one officer spotted a wolf at the campground, but it escaped, Provost said. A short while later, an officer saw a wolf matching the description and fired one shot but missed and the wolf took off. 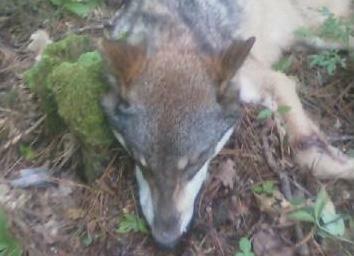 So authorities called in trappers who caught and killed a wolf there early Monday. The carcass was taken to the University of Minnesota for a necropsy, including DNA tests to try to confirm it's the same animal that attacked the teen.